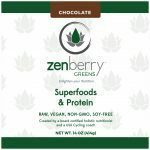 Zenberry Greens is a chocolate superfood protein powder packed with leafy greens, probiotics, enzymes, grasses and algae. 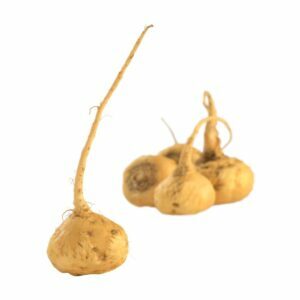 These can help support the liver, digestion and the immune system. 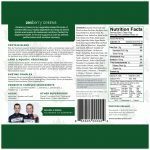 It is also great for athletic recovery, giving your body the nutrition it needs to help it perform at its best. 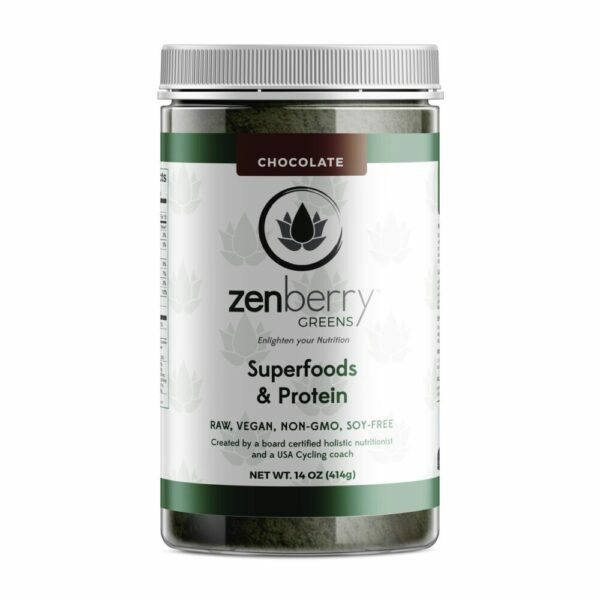 Zenberry Greens is a chocolate superfood protein powder packed with leafy greens, probiotics, enzymes, grasses and algae. These can help support the liver, digestion and the immune system. It is also great for athletic recovery, giving your body the nutrition it needs to help it perform at its best. 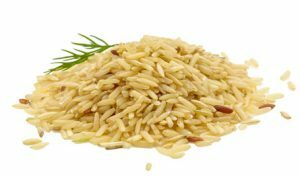 It is a no-compromise blend of raw, organic superfoods and highly-digestible brown rice protein. 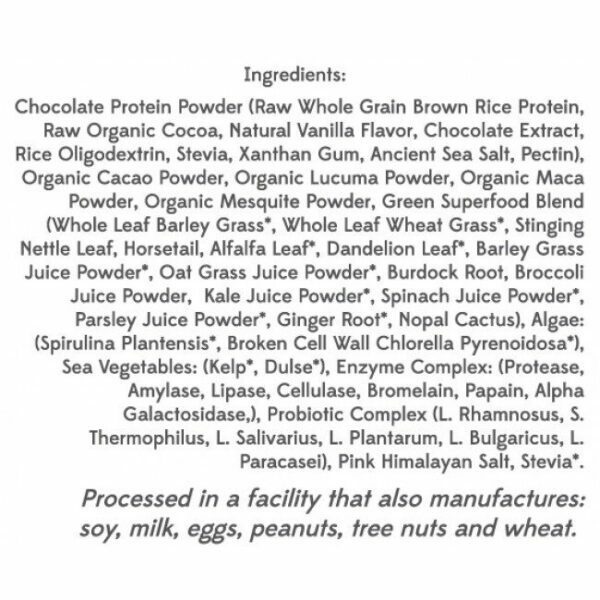 All of this in a convenient powder that doesn’t taste like grass clippings or medicine. It actually tastes like a chocolate milk-shake! Lose weight, get healthier, fuel your workouts or just enjoy a delicious chocolate smoothie that won’t rot you from the inside out! 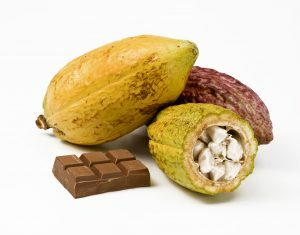 Our chocolate comes from real raw organic cacao, not some cooked down version of it or cheap flavoring. Cacao is one of the most nutritious foods on earth when in its natural state, raw. Get your chocolate fix without the junk or sugar. 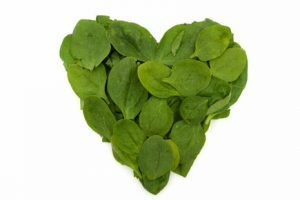 We all know that vegetables, especially leafy greens, are nutritional powerhouses and we should be eating more of them. This is easier said than done, though, right? Now it’s easy. 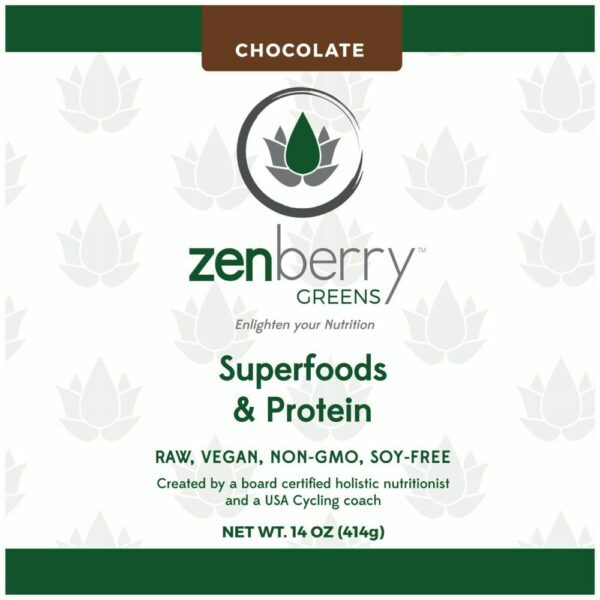 We selected the most powerful vegetables & grasses for Zenberry Green but don’t worry, it still tastes like chocolate! Hooray! These are both aquatic algae packed with protein. Actually, gram for gram, they have much more protein than beef. 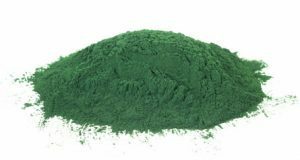 Spirulina can be up to 71% protein, the highest of any food on earth. 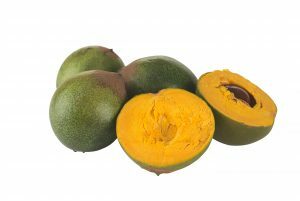 They also contain chlorophyll, beta-carotene (vit A), B Vit, Vit E & K, essential fatty acids, 8 essential amino acids, gamma-linolenic acid (GLA) and as much iron as red meat. 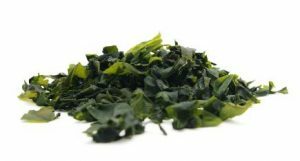 The present of “the master antioxidant, superoxide dismutase helps make these algae very effective for detoxing the body of heavy metals and toxins. The Probiotic Complex (1.5 billion cells per serving) helps to support your digestive tract with a potent mix of probiotics including: L. Rhamnosus L. Salivarius, L. Plantarum, S. Thermophilis, L. Bulgaricus, L. Paraasei. 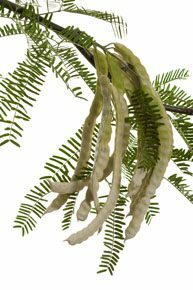 These probiotics increase the absorption of the natural vitamins and minerals present in all of these superfoods and help to repopulate the beneficial flora of the digestive track. Ayurdevic medicine believes the immune system is located in your digestive track so keeping it strong and healthy is important for your overall health. Enzymes Enzymes help with digestion of all the superfoods in Zenberry. Our enzyme complex contains amylase, lipase, protease, cellulase, bromelain (from pineapple), and alpha galactosidase. (all from aspergillus). 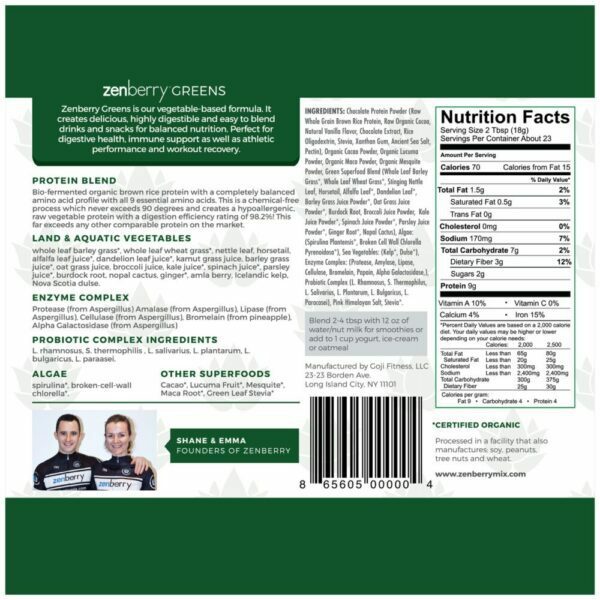 Every ingredient in Zenberry has been well thought out and must provide a nutritional benefit, as well as, good taste. This even includes our salt. 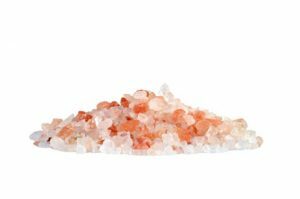 We chose Himalayan Pink salt because it has a rich mineral content that includes over 84 minerals and trace elements such as: calcium, magnesium, potassium, copper and iron. This salt is recognized for its beautiful pink color, high mineral content, and its therapeutic properties. Regular consumption of Himalayan Pink Salt provides essential minerals, trace elements, balances electrolytes, supports proper nutrient absorption, eliminates toxins, balances the body’s pH, normalizes blood pressure, and increases circulation and conductivity. HIGH QUALITY INGREDIENTS AND TASTES GREAT! I regularly purchase zenberry green and vanilla chai zenberry flavors and love them both! Typically I consume them blended into fruit / green smoothies with unsweetened almond milk or coconut water. 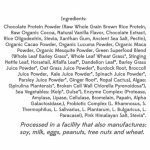 I’m very impressed with Zenberry’s commitment to quality ingredients, sustainable sourcing and producing products that taste good. My go to zenberry smoothie is blended frozen banana, 1 tbs ground flaxseeds, 2 tbs zenberry vanilla chai and unsweetened vanilla almond milk. Simple and delicious. I discovered Zenberry at the WSSC Miami conference in 2013. Due to complications from an abdominal surgery, I had my doubts if I would be able to get through so many cycling classes that weekend without being able to eat properly. I was really disheartened after traveling all the way from the west coast. Fortunately for me, Emma had set up shop at the conference and I bought my first bag of Zenberry Blue. I am positive I would not have made it through the weekend without the pure and energizing nutrition I received from the great product. I regularly buy Zenberry Green and Blue and find the flavor awesome. I keep things simple by just blending banana and frozen berries (sometimes fresh avocado) and ice. If I have fresh spinach I also toss a generous handful in and pat myself on the back a little. I also enjoy the coffee flavor and use that to mix things up. I have never been a fan of Chai tea, but I do enjoy the Zenberry Chai on occasion. So if you like chi you will love the Zenberry Chai! I see myself continuing to buy the Zenberry products for many many more years. Love this stuff! THE BEST START TO THE DAY! Tasting like chocolate milk shake, yet filled with probiotics for gut health, super-charged superfoods, and lots of our daily greens. Whenever I fall off the “good eating wagon” a few days of Zenberry Green shakes in the morning get me and my gut tastily and happily back in the groove. Love my Zenberry. PART OF MY EVERYDAY ROUTINE! I start each day off with my Zenberry shake and look forward to it every morning. 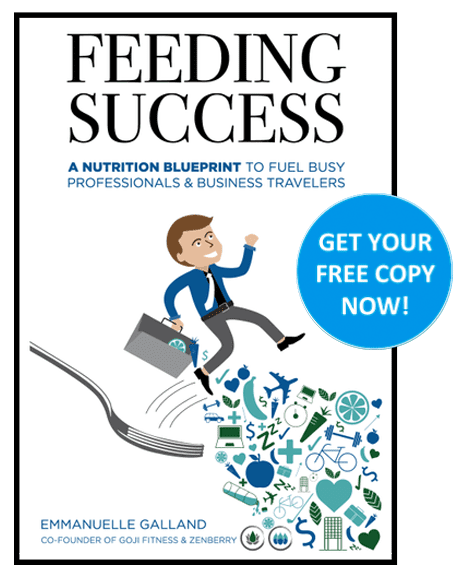 It’s absolutely delicious and has helped me maintain my health and weight for over a year now. Highly recommend this product! 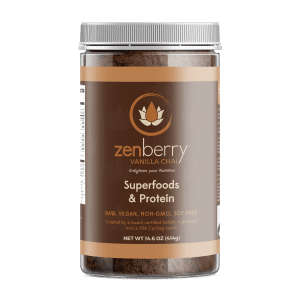 I’ve been taking zenberry green for the past two years almost and it’s the best vegan probiotic protein powder I have tried. It’s also incredibly yummy!!!! I know and trust the co founders and they have taken great care in sourcing the key ingredients. It is my and my husbands morning fuel every day and post workout meal as well. A day without zenberry is incomplete!! !